At this year’s National Cadet Competition not only did the eight regions of the Civil Air Patrol gather to vie for the coveted Chief of Staff Sweepstakes Trophy, but two cadets were also honored with the presentation of their recently achieved General Carl A. Spaatz Awards. 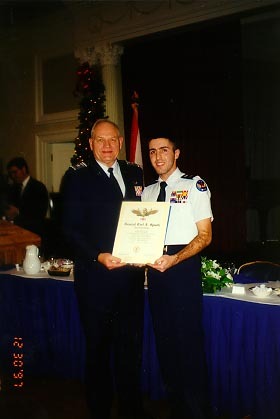 Brigadier General Paul M. Bergman, National Commander, CAP, presented the General Spaatz Award to Cadet Colonel Hugh O. Stewart and Cadet Colonel Kevin M. Cavell at the beginning of the competition’s awards banquet (#1332 and #1345 respectively). The two cadets were also presented with the Air Force’s 50th Anniversary Commemorative Coin by the Air Force Honor Guard, who were special guest judges of the competition and performed at the banquet. Cadet Stewart is a member of the Florida Wing and commanded the Southeast Region Drill Team at the competition, while Cadet Cavell is a member of the New Jersey Wing and the Northeast Region Drill Team. After the presentation, during the NCC awards ceremony, it was discovered that both cadets and their teams did extremely well at this year’s competition. Cadet Colonel Stewart and the Southeast Region team received three first place awards (Inspection, Innovative Drill, and Physical Fitness) and two second place awards (Standard Drill and Panel Quiz), taking second place in the overall competition. Cadet Colonel Stewart also received the individual Team Commander’s Award. Cadet Colonel Cavell and the Northeast Region team also received three first place awards (Standard Drill, Written Exam, and Volleyball) and three second place awards (Inspection, Innovative Drill, and Physical Fitness), placing first in the overall competition. Outside of the Civil Air Patrol, Cadet Cavell is a third year Rutgers University student majoring in Computer Science and Electrical Engineering and Cadet Stewart will be attending college in the Fall. Congratulations to both cadets for achieving this coveted award and their teams for a great showing the National Cadet Competition.